In the previous part we created an IDoc structure which can carry our data from source system to target system(s). In this part we will understand how to setup the source system to be able to generate and send an outbound IDoc. You can download sample code for the above program here. Thus we have completed sender side configuration required for ALE. In the next part we will see how to configure the receiving system to be able to receive and post the inbound IDoc. Do read Your First XI Scenario. This will help you to understand XI basics. You can also go through other articles in SAP XI category. You will find a number of different scenarios. We are dealing with Variant configuration, we need to transfer Master Data from DEV to QAS, though heavy work load no body helped me, I was so frustrated, if I couldn’t, then it was much of I had to do manually, but your document helped me lot and I could transfer all master data, I am thankful to you form bottom of my heart. Kind Regards from Sameer Hajuri. Good efffort..keep it up..I am a certified SAP Xi consultant..and found ur step by step approach indeed informative. Many thanks Senthil for your compliments. I need to understand how do we Trigger IDOCS for e.g if we have any idocs related to FINANCE how do we trigger the IDOCS and map the required data and post in R3 incase of INBOUND Idocs. GL Posting issue how to achieve this using IDOCs[Inbound] ? I just want to know that what do we define in message types ane wht do we basically need that. Every IDoc is made up of a basic type and a message type. e.g. in case of Purchasing/Sales order IDoc, ORDERS05 is the basic type and ORDERS is the logical message type. For details on how to define these, please check out the first part of this article series. Can you More info regarding the Debugging Reports,FM,Include programs…etc? I’m new to sap and i found your blog really helpful.Good work..Thanks . Please request your Basis administrator to provide you authorization to access transaction SM59. You need to configure ports so that one system can access the other. Ports are nothing but the configuration settings which define the RFC connection which should be used to connect to the partner system. Outbound means messages being sent out from the source system while inbound refers to the messages coming in or being received in to the target system. Thank you very much for your replies ..it really helped me to understand the basic process and I appreciate ur help.In transaction BD64 what is the use of ADD BAPI icon.How BAPI is related to IDOC.And difference between BAPI and RFC. If possible could you post something on USER-EXITS and BAPI’S too . Thanx for providing such a nice document. I m new to ALE IDOC.I have few questions. I want to send IDOC from WCD300 to WCD320 client. So, I created two partner profile WCD300 and WCD320 in WCD300 client. this profiles also have outbound parameters which gives information about port and RFC destination. Now my question is WHICH PROFILE OUTBOUND PARAMETERS IS USED BY MASTER_IDOC_DISTRIBUTE in order to get information abt port and rfc dest? A system always uses the partner profile of the partner it communicates with. So source system refers the target by the target’s partner profile created in source system. Similarly, target system refers the source by the source’s partner profile created in target system. In short, partner profile is meant to indentify the system we are communicating with. Its really very good site .. good work keep it up. i am new to Idoc can you send me detail of it. any website or ppt which will help to learn idoc initilly. You may want to go thru the first part of this article series. It explains the basics and structure of IDoc. Your manual helped me to set the message type INVOICE but when generating the message of the invoice in VF02, the message is not processed is in yellow. And when you double-click the message I get the indication that -No communicatin data has been defined for transmission medium 6-. Configure the output type for transmission medium 6. Go to Maintain Output Types in the IMG for whatever type of document you are trying get output for. Select the output type and then double click on the processing routines folder. Create an entry here for medium 6. Thinks for you superb site. Iam facing a problem using we64. when i tried to distribut the model view , i get a meesage error .Reason : distribution model is currently being processed . Do you have any idea of what is means? Try closing any open sessions and try again. I guess this should help. This document was really helpful in understanding the ALE and Idoc concept. However, I’ve a question for you: Our requirement is to move data from ECC to CRM system. We thought of using RFC adapter but due to some concerns, we could not implement and finally we’ve decided to use proxy to integrate ECC and CRM systems. I’ve no idea about Proxy (this is the first i’m going to work on integration part). Can you please tell me what is a proxy and how we can use proxy in integrating these two systems and be successfull in moving data from ECC to CRM system? Proxies are used where we do not have appropriate BAPI function modules. Proxies are advantageous over RFCs in many ways. They are flexible and speed up the implementation. Have a look at this link for more info. For proxy based scenarios following links may be useful: ABAP client proxies, ABAP server proxies. I’m even impressed with your speedy reply too. Will sure be back if i’ve any further questions. Could you please send me some more elaborated document on basics and need ALE and IDOC in step by step approach. closing the sessions and all. even after couple of days also i am gettng this error. This error is suddenly coming when i tried deleting the existing model and tried recreating it. kindly tell me the solutions if any. Check if there are any locks in source and all target systems via SM12 transaction. Otherwise you can create a new model with a new name. If only two systems are involved, you can even create partner profiles manually on each system. The best post I have ever seen. Many thanks. I have one complex scenario I want to ask your opinion about , is it possible to atache a file with a description. Partner profile LS_A or LS_B? In another scenario i have to connect System A(100) to another system Z(500). Where system Z is sending and system A is Receving. Now i have already Logical system defined in System A for Idoc transfer to System B. So in in ALE side for getting connected with System Z do i need to create the Logical system again in system A? Look at two systems in a broader sense. Say System A belongs to your organization and System B belongs to a rtade partner organization (say a customer or a supplier). So message that goes out from System A to System B, would be defined in the partner’s profile for System B (which is ofcourse defined in System A). Since the message goes out, define it in Outbound parameters. Similarly, System B receives the message from System A. For System B, System A acts as a partner. So define a partner profile for System A in System B. And since the message is incoming to System B, define it in the Inbound parameters. For the second question: Whenever you add an ALE partner, you need to add a logical system. You dont have to do client assignment for the partner system. Client assignment is only for your own system i.e. System A in your case. You already have a client assigned to System A. 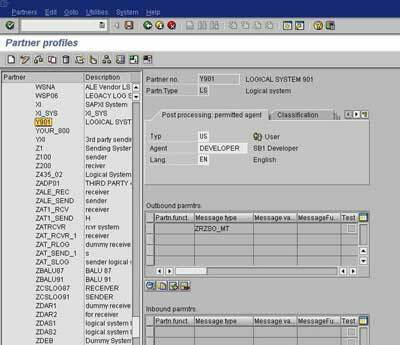 To receive from System Z, define a partner profile for System Z in System A in the Inbound parameters. Help me over this issue. second segment containing fields from T005U table(state) and is child of Country table. please guide me how to do this and what are the steps for this as i have to transfer data from sap and then the through .net connector it will be picked by Ivend guys. This article describes the very process of generating and sending a custom IDoc. See the ‘Outbound IDoc Generation Program’ section for a sample ABAP code for IDoc generation. we have a client 900(ec5.0) and 910(ehp4) . settings are re-configured in 910 same as 900.
automatically effect in 910 also. .
here am bale to send master data using ale -idoc..
but how to send transactional data . all the transaction madin 900 shoule be also in 910. Generally, ALE is meant for communicating with different SAP systems. You at least need to get another client configured to try out an ALE scenario and comprehend the configuration steps fully. Can you help me on following. I am working on DEBMAS05 Idoc. Sender system sending DEBMAS05 Idoc which is an Idoc Extension with two Z segment. Now here is my problem. In Receving system if i am extending the DEBMAS05 its asking for Access key.Which i don’t want. Is any other alternative of doing this? I have two below option but not much clear about it. 1. If i copy the DEBMAS05 to ZDEBMAS05 and then do idoc extension.In this case do i need to also make ZDEBMAS. or i can using DEBMAS as Message type for ZDEBMAS05? 2. I found one function-exit ‘EXIT_SAPLVV02_001’ in (user-exit VSV00001) which has description ‘Read and Post Additional Export Customer Master Segments’. can i use above function-exit in DEBMAS05 without extending the Idoc for Z fields in reciver side. Thank you sharing very useful tutorial. As my SAP is not advanced,I like to ask few question. The table you had given in the beginning of the tutorial,I had created in the SAP and code sucessfully compiled.The problem, I am facing it that it not accept any S_kunnr if selected among the list. Therefore,I like to ask the tables you have provided in the beginning are the reference tables or they are new(examplary) tables. (Getting an Error:No customers Found). Please suggest to get rid out of this problem. Your early reply is requested. We are trying to map a proceee based on Incoming IDOC converted to Sales SLA.The problme we are facing is we are not abe to find perticular IDOC configuration for SLA. We are trying to use message ORDERS for the same but are facing problme with screen sequence. Please let us know how can be mapped and do we have dedicated standard IDOC configuraion for SLA. I have 2 cross clint 200 and 500 on our dev server. No filters , No conversion , No version change . You may want to try BD87 to push the IDocs. There are no errors in your IDocs. U r doing very good job . i m working on abap n i m interested in learning XI/PI ,idoc . Thanks for the very informative site! I am currently having problems in sending an IDOC from R/3 system to XI. I followed your steps and everything is setup until tcode BD64. when I access this tcode, it returns an error message saying “Local Logical System is not defined”. Would appreciate your help. Thanks! You need to define a logical system corresponding to the local system using transaction SALE as explained in the beginning of the article. I have datas in an xml file, which i have uploaded to internal table and have all control records, data records details. I want to create an inbound idoc with these details.Please suggest me the FM to be used. I have one sample pgm frm client using RSEINB00. I am not understanding how it works.Can You suggest any way other than this pgm and also please overview a brief on this pgm. The messgae type I use is ZMBGMCR. Function module MASTER_IDOC_DISTRIBUTE is generally used to create IDocs. However, when you already have data within your system, you need not create any IDocs. You can directly update the database tables using appropriate function modules locally. Alternatively use the RSEINB00 program. Very informative post, thanks for sharing. See you again. Great job! All Concepts are very basic and easy to learn. I want to learn SAP PI. Could u pls provide me the link for how to create Software component in PI. This article should help you – Your First XI/PI Scenario. 1) port, RFC,tRFC, need of partner profile, difference betwen basictype and messge type ,extension? 2) how can we restore the deleted idoc again? This really is the content I need to. Thanks for writing this article. Just writing to say thank you for your great contribution on this website! We – ABAP developers – really appreciate your effort to share all your knowledge to us. Fantastic information & well structured. Thank you! I’m new to supporting EDI/IDOC’s & your articles have been useful. I’m concentrating mainly on intercompany processing, with the generation of the FI AP entry off the back of an intercompany invoice. The business has added new conditions for recharging. New condition type posting to a GL that is COPA relevant. Postings are successful for both FI & COPA & no errors occur. However, the COPA doc. is lacking many of the characteristic values, e.g., customer, material etc. There is only profit center & company code. I think this is due to the fact it is an FI entry. I have a feeling the IDOC will need a new segment for the COPA related data? Thanks for sharing your info regd Idoc’s, before i have little bit confussion abt IDoc’s, now i had an clear idea about IDoc. Thanks for your help. Could you please give me some more informations related to ALE IDocs. It will be very helpful for me. Could you the ale and idoc document. I looking for Idoc for Po creation, change and confirmation. I would appreciate if you could respond to me. Riyaz bhai please forward the complete guide about ale idoc to my mail id.